Lindsay graduated in 2009 from Brock University in Canada with her Bachelor of Science (Health Sciences). In 2013 she completed her Masters of Physiotherapy degree at the University of Canberra. Lindsay spent the first two years of her physiotherapy career managing the physiotherapy department of an aged care facility, where her practice was focused mainly on pain management, neurological and joint replacement rehabilitation, and falls prevention. 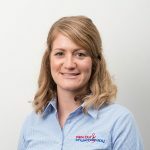 In early 2016, Lindsay began work at Flex Out Physiotherapy, where she treats a variety of musculoskeletal conditions.She has developed a special interest in paediatric physiotherapy.